I sometimes have the feeling that I get addicted to certain things much too easily, like I did to Dragonette’s album and to Paul Hollywood’s marzipan – I have used it yet again, this time as a filling to Dan Lepard’s insanely tender and delicious lemon buns. Start the night before: in a large bowl, mix together the flour, salt, lemon zest, yeast and sugar. Melt the butter and beat with the milk and egg. Pour into the dry ingredients and mix everything together until a soft, sticky dough forms – I used the Kitchen Aid with the dough hook for that. Mix thoroughly, scrape any remaining dough from your fingers, cover the bowl tightly and leave in the refrigerator until morning. Remove dough from the refrigerator and set aside at room temperature for 30 minutes. Line a 25cm (10in) square baking pan with foil, leaving two overhangs on opposite sides, and butter the foil – I used a 20x30cm (8x12in) baking pan. Lightly flour a work surface, knead the dough until smooth (again, the Kitchen Aid), then roll to a long rectangle about 70x10cm (28x4in). Roll the marzipan into a 70cm (28in) cylinder, place along the centre of the dough, then roll the dough around it to seal*. Leave the dough to relax for 10 minutes, then cut into nine slices and place in three rows, without turning them on end, into the prepared pan. Leave to rise for 1 ½ hours or until doubled in volume. Preheat the oven to 200°C/400°F. Bake the buns for about 35 minutes or until golden. 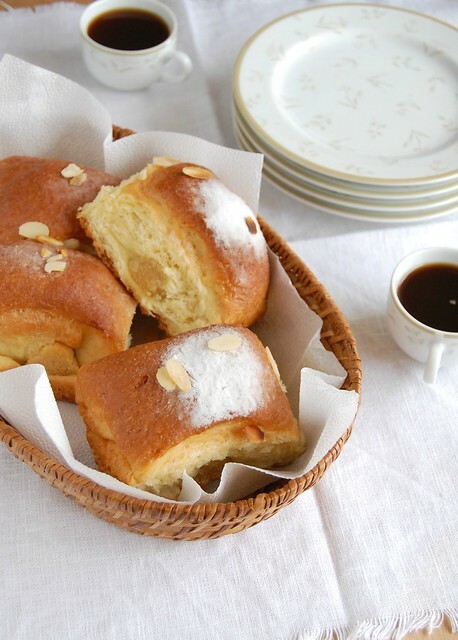 Cool in the pan then brush with melted butter, sprinkle with the almonds and dust with the icing sugar. Gorgeous little buns, I love lemon and almond together! Great buns! They look delicious!